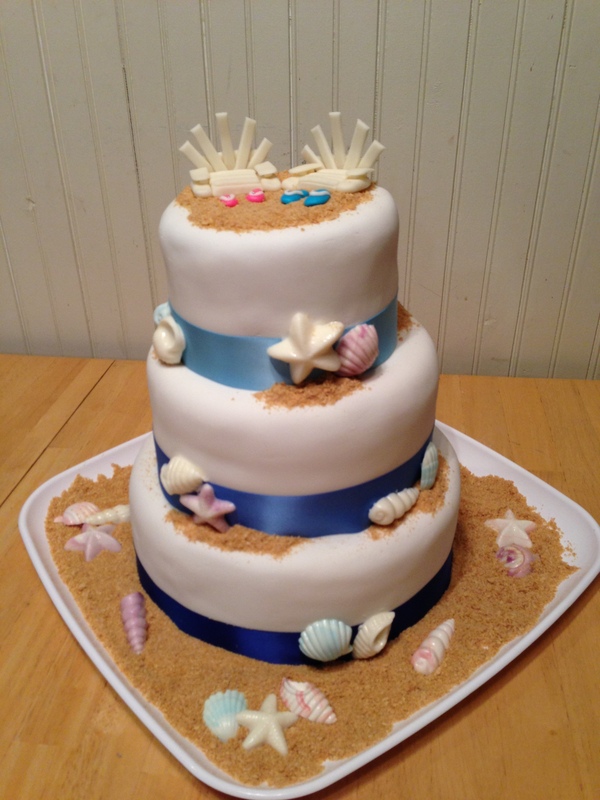 Courtney and I made this beach themed wedding cake for our friend Stephanie who got married yesterday. It was a fun cake to put together. The cake is chocolate then covered in buttercream icing and finished with white Pettnice fondant. The “sand” is graham cracker crumbs and the shells are Wilton white candy melts swirled with blue, pink and purple candy melts. Cort made the Adirondack chairs and flip flops out of fondant and Wilton Shape-N-Amaze. It was heavy! I weighed it cause I was curious and it weighed 20 pounds! Congrats to Stephanie and Blake! We’re so happy for you both, thanks for letting us be a part of your big day.